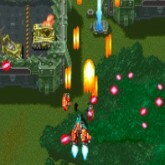 Description: Wow when I first played DonPachi I was amazed by this Cave classic SHMUP released in 1995. The sound, music, levels, airplanes and bulltestorm style gameplay were all top notch. The player can choose from 3 different airplanes that have different powers to choose from. The scoring system in DoPachi is cool, the faster you take out enemies the more score you will earn. Always have to blast and move fast, its a nice training game if you want learn how to get good at Shoot Em Ups.Oh and the announcer is funny lol.